Eero, the smart WiFi system that Google WiFi seems to have modeled itself after, is set to receive it’s biggest platform update to date. That means up to 2x speed improvements on networks, more intelligent WiFi throughout a home, Amazon Alexa integration for controlling your home setup, and a bunch of new features in mobile apps. In general Eero network improvements, you can see the full list below as posted by Eero. But as I mentioned, once the update hits your network (and it should be live – at least it was on mine), you should see much faster speeds (up to 2x) between Eeros and TrueMesh technology that tries to “intelligently use the fastest, most reliable path for customers’ WiFi,” adapting your setup to the “complexity” of your network layout. TrueMesh also allows for systems to add on as many Eero units as needed. 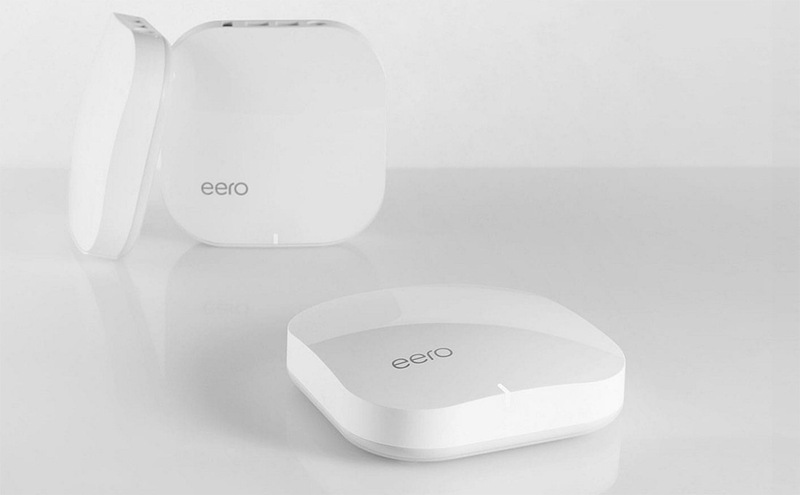 Local Area Network (LAN) speed improvement — Overnight, eero customers may see up to two times the LAN speed (speed between eeros) within their networks, with initial testing showing over 40 percent speed improvement on the average network. Intelligent WiFi that adapts to the home — With dynamic rerouting, TrueMesh makes it possible for eero to intelligently use the fastest, most reliable path for customers’ WiFi, so their networks automatically adapt no matter the network demand or the complexity of their home layout. Add as many eeros as needed — TrueMesh makes eero systems even more expandable, so customers can add as many eeros as needed to cover even the largest homes or the most complicated layouts. With Amazon Alexa integration, you’ll soon be able to ask your Echo device to find devices in your home, like a phone or laptop or tablet, as long as it is connected to WiFi. You’ll also be able to pause internet by voice and turn off the LED on Eero units as you go to bed or need some extra darkness. Find a misplaced device in the home — If a device (such as a phone or laptop) is still in the home and connected to WiFi, customers can ask Alexa which eero their device is connected to so they know where to look. Pause the internet — Using Family Profiles, pause the internet for dinner or other family moments. Nothing vital — eg, security cameras — should go offline. Simply use the eero app to unpause and get everything back online. Turn off the LED — Customers can ask Alexa to turn off the LED light on eero for bedtime, which has been a top-requested feature from current customers. This feature is also now available through the eero app. In the newest update to the app, Eero is allowing you to see much more info for connected devices (something that has been needed for a while now), like which devices have solid connections, how much data they use, and which Eero each device is connected to (So much yay.). Outside of that good news, you’ll see ISP connectivity status, placement suggestions for your Eero units, and also be able to control the LED lights, should you not have an Alexa. More info about connected devices — See which devices have good connections, which use the most data, and which eero each device is connected to in the home. Placement suggestions — By better understanding the strength of eero-to-eero connections, the app, if necessary, can offer tips on how to improve performance through better placement. ISP connectivity status — If the internet is slow or goes down, the eero app will automatically detect it and recommend steps for how to determine if the issue is with the customer’s Internet Service Provider (ISP) (such as an outage) or with their own network. As I mentioned, the big network update appears to be live. However, I have not yet seen the Android app update. Be on the lookout!